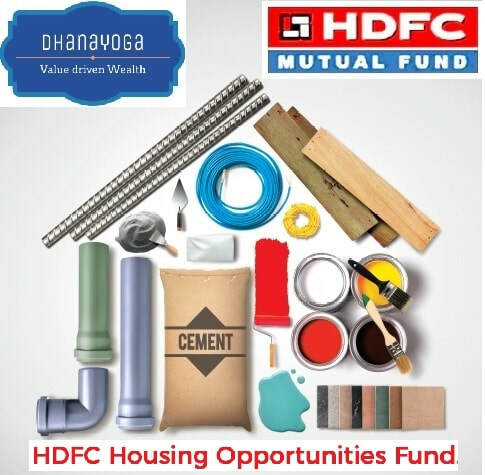 Fund Objective: To provide long-term capital appreciation by investing predominantly in equity and equity related instruments of entities engaged in and/or expected to benefit from the growth in housing and its allied business activities. Participate in the expected growth in Indian housing sector and allied businesses. Cement & Cement product such as concrete, aggregates, bricks, etc. Consumer durables will include home appliances, electronic items, furniture & fixtures, etc. Dhanayoga clients can inform their Name and amount to invest, receive a link on their email id and invest via online or Cheque/DD. HDFC is a leading provider of Housing Finance in India, who have fulfilled over 5.8 million home owner dreams since inception in 1977.